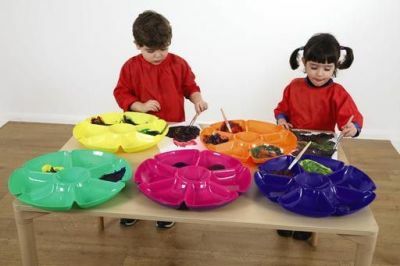 Brighten up the classroom using these flower paint trays in assorted bright colours. Holds paint and other liquid crafts easily without making any unwanted mess. The plastic trays mean you can easily wash and reuse them many times, the wide bases reduce the risk of spilling, making them suitable for younger years in classroom environments. Each tray has a diameter of 40cm and is available in sets of six.